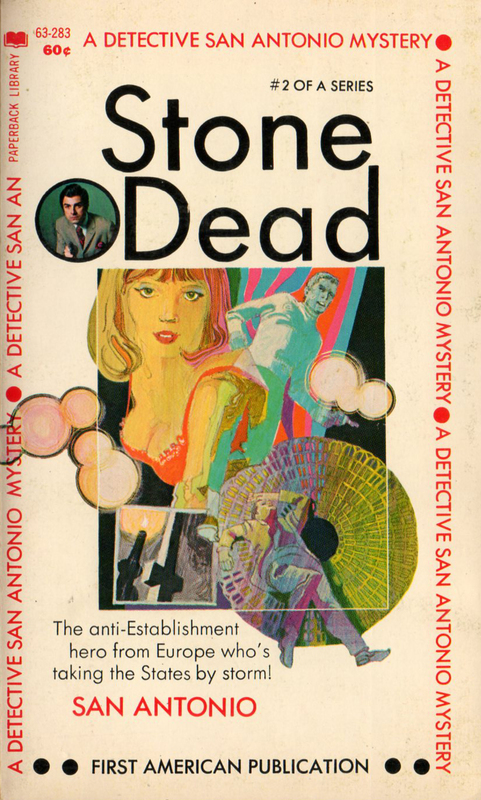 British paperback publisher Sphere Books, founded in London in 1961 ambitiously undertook in 1968 the publication of the San-Antonio series. By that time, 70 novels pertaining to this Series had already been published in their original French. Their titles are listed, together with an English translation in the frontmatter pages of the Sphere books. The reader’s curiosity was triggered, but never satisfied. Only a few of the corresponding texts were to be translated. Titles such as San-Antonio in the groove or Action all the way and Swim or sink, San-Antonio never were. Sphere only published seven San-Antonio, and gave up on the project by the end of 1969. What remains are titles without books, a library left incomplete. A vacant lot of titles, a literary ghost estate. There is a striking contrast between Georges Simenon’s status as an international bestseller, and his younger contemporary, once friend, and main challenger in the French market, San-Antonio. 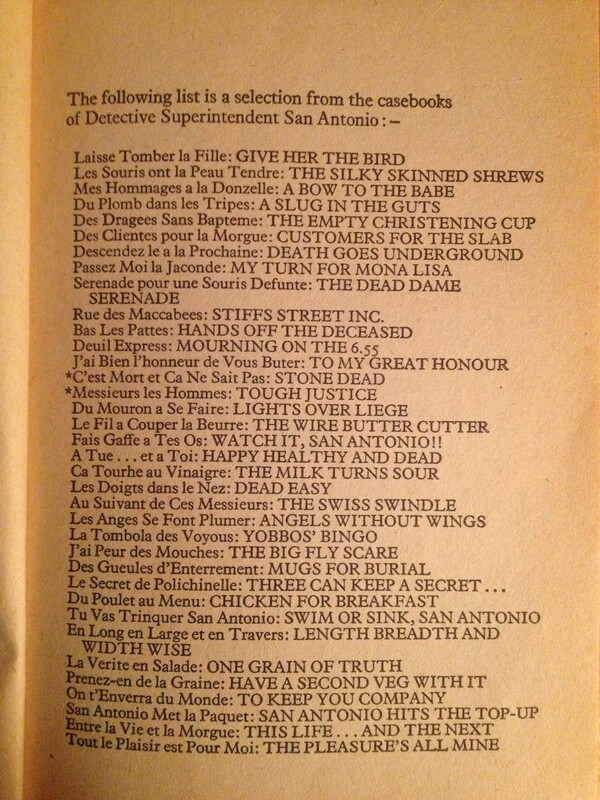 The latter, with his eponymous character, the Commissaire San-Antonio, an ironic hardboiled counterpart to Simenon’s Maigret actually far surpassed Maigret in terms of sales in French, yet is virtually unknown in the English speaking world. Too much of his idiosyncratic verve seems to get lost in translation. As American Scholar Susan Dorff once put it, in a survey published in the Armchair Detective, San-Antonio, the king of the kiosks in France is also one of her best-kept secrets. With over 100 million San Antonios in circulation and 200 different titles, many of them published, at a point, in 600,000 mass-market paperback, this is a vast, and vastly untranslated continent, which English readers could only view from afar, if at all. Here is a list of English and US translations, with some images of how the books actually looked like.